Did the Battle of Fredericksburg Change the Identities of Irish Soldiers? 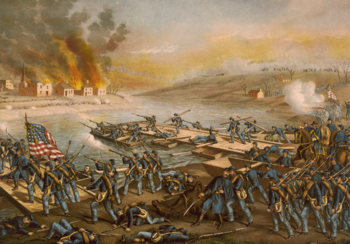 Whose blood was spilled December 13, 1862 on the battlefield in Fredericksburg, Virginia? During the American Civil War, the Battle of Fredericksburg was but one meeting ground of Irish immigrants from both the Union and Confederacy. Once fellow countrymen, these soldiers were forced to assume new perspectives on their identities amidst the chaos of war. The ability to consider themselves Irish immigrants vanished when they donned a blue or gray uniform. With the Battle of Fredericksburg as an example, where the predominantly Irish 24th Georgia regiment of the Confederate States of America (CSA) engaged the Irish Brigade of the Union Army in battle, ethnicity clashed with nationality. Once the first shots were fired, these men were no longer Irish brethren; they became enemy combatants. The Irish soldiers, who defined themselves primarily through ethnicity, were instantly adopting a new national identity; therefore, the blood spilled on that tragic day was that of Confederates and Americans. The bodies that filled those blue and gray uniforms were no longer Irishmen as nationality prevailed over ethnicity. The Irish exodus to the New World came in waves due to various economic and environmental factors. Although Irish inhabitants were present in America beginning with the settlement of Jamestown, the first significant exodus, which brought just 7,000 migrants, occurred from 1718-1729 because of a crop failure in Ireland. A drop in the linen trade brought 50,000 Ulster residents between 1730 and 1754. With vast expanses of fertile soil and a lifestyle akin to rural Ireland, America’s southern states were a natural fit for Irish planters. Beginning with the exodus of 1718 until the eve of the Civil War, five generations of Irish farmers sailed to the U.S. and adopted a feeling of ownership in America. Confederate John C. Mitchel and Unionist Thomas Francis Meagher both came to New York after being exiled from Ireland for their rebellious acts against England. The two leaders continued to work together in New York in an attempt to promote awareness of the Irish plight due to the Famine. Meagher saw the U.S. as a sanctuary for destitute and exiled Irish immigrants whereas Mitchel became increasingly disillusioned by the rampant poverty and discrimination faced by his fellow Irishmen. He worked his way south and settled in Richmond, Virginia by the time war erupted. Similar to the situation in Ireland, the South was an agrarian culture that hated interference from a dominant national government. The North; however, was an urban industrial society and a hotbed for the growing abolitionist movement. Peculiar to the South, slavery not only provided an unpaid labor force, the institution also constituted a permanent underclass. Whereas Irish Catholics in the northern states faced racial and religious discrimination and unemployment, Irish members of the southern states lived in a society wherein African American slaves filled the role of the inferior other. 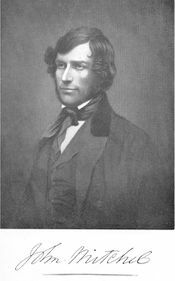 An outspoken secessionist and staunch supporter of slavery, Mitchel stated that, “in national character the North is more English, the South more Irish.”  Given the hatred felt by Irishmen toward the English, sentiments such as these incited fervent support among southern Irishmen for the cause of the Confederacy. His counterpart was taking a different approach to garner support in the North. 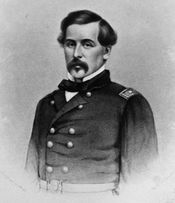 With the departure of Mitchel and the support of the Catholic Church, Thomas Meagher departed from his position as a passive Southern sympathizer and embraced the role of outspoken advocate for the Union Army. Though not blind to the low wages, scarce jobs, and rampant racism, Meagher maintained his great appreciation toward the United States for being a refuge for his countrymen. He showed his appreciation when he did not hesitate to enlist in Company K of the 69th New York Volunteer Regiment. After the Union’s crushing defeat at the First Battle of Bull Run in Manassas, Virginia, the 69th returned to New York where Meagher spoke in order to bolster recruitment among the Irish. He urged his countrymen to “rise in defence of the flag,” that harbored them safely from the “poison of England’s supremacy.”  While trying to enforce the sense of “Irishness”, both Meagher and Mitchel actually introduced a new nationality to their Irish followers, which emerged as the defining factor of identity when these men met in Fredericksburg. Against the advice of his subordinates, General Ambrose Burnside, then commander of the Army of the Potomac, ordered his troops across the Rappahannock River and into Fredericksburg. The Confederates retreated across an open field behind the town and dug in atop a hill known as Marye’s Heights. Burnside then deployed a massive infantry assault to take the Heights; with the hope of proceeding southward to the Confederate capitol of Richmond. Hence, on December 13, 1862, the Irish soldiers of the Union came into direct conflict with Irish soldiers of the Confederacy. Infantry regiments from New York, Massachusetts, and Pennsylvania composed the Union’s famed Irish Brigade; commanded by the General Thomas F. Meagher. On the Confederate side, Brigadier General T.R.R. 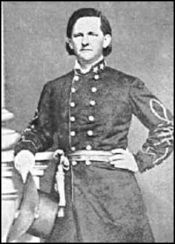 Cobb led a brigade that included the overwhelmingly Irish 24th Georgia Regiment. From their vantage point, the 24th had a clear view of the emerald battle flag emblazoned with the gold harp ̶ ̶ ̶ Ireland’s symbol ̶ ̶ ̶ of the 28th Massachusetts regiment that led the entire Irish Brigade into combat. The Brigade marched together across the open field at the base of the Heights and began the climb up a slope to a stone wall that concealed the men of Cobb’s Brigade; including the 24th Georgia. When they got to within “50 paces of this wall, Cobb’s solid brigade of Rebel infantry, said to have been 2,400 strong, suddenly sprang up from behind it,” and fired in unison directly into the oncoming Irish Brigade. When Cobb’s men of the 24th Georgia arose to fire, so too did their battle flag, which was also adorned with the gold harp amid the stars and bars of the Confederacy. Neither Pickett nor Hutton was Irish; therefore, the Confederate cheers given for the men of the Brigade were given in recognition of the bravery that was displayed. Ethnicity did not play a part in the display of admiration as the combatants were no longer countrymen. Upon realizing that the division that held Marye’s Heights was composed of several Irish regiments, Union Captain D.P. Conyngham remarked that the men of the Brigade were “pitted against their countrymen.”  This is an incorrect statement as one cannot simultaneously fight for and against the same country. Ethnicity, not nationality, was the common thread that linked the Irish soldiers of opposing armies, thereby making it impossible for enemy combatants to be considered fellow countrymen. The opposing soldiers shared an ethnic heritage and were, at a previous time, fellow countrymen; however, at the time of battle, the country that was home to the Irish soldiers of the 24th Georgia Regiment was the Confederate States of America just as the men who marched with Meagher were members of the United States of America. Soldiers such as William McCarter belonged to only one country at the moment they were battling Irish Confederates in Fredericksburg. Private McCarter published a detailed account of the battle as seen through only his eyes. In the entirety of his memoirs, he never once mentioned the Irish ethnicity of the enemy. He spoke of both his fellow Union soldiers and those of the Confederacy as men who fought for “their country.” Irishmen like McCarter and Private Williams of the 24th Georgia were both born in Ireland and were at one time fellow countrymen. They were again upon their arrival in America. After Georgia seceded from the Union (January 19, 1861); however, Williams became a citizen of the Confederacy thus severing national ties with McCarter. Ethnically, nothing had changed, yet with the cultural and political influences to which these men were exposed upon enlistment into the army, each man began to adopt a new identity. An introduction to new surroundings and constant exposure to national ideals, be they Union or Confederate, created a loyalty among soldiers with whom they shared like notions. With shared opinions and a common enemy both McCarter and Williams adopted a group mentality that solidified a new national identity, which was carried onto the field of battle. When Irishmen faced one another in battle, nationality emerged as the decisive factor in identity for the Irishmen who fought in the American Civil War. ↑ This article draws from research previously submitted to Arizona State University by this author. See Carol Costello, “Ethnicity and the Self: The Shifting Identity of Irish Soldiers in the American Civil War.” (2014). ↑ Jay P. Dolan, The Irish Americans: A History (New York: Bloomsbury Press, 2008), 6-8. ↑ Phillip Thomas Tucker, Irish Confederates: The Civil War’s Forgotten Soldiers (Abilene, TX: McWhitney Foundation Press, 2006), 12. ↑ Lawrence Frederick Kohl, Introduction to The Irish Brigade and Its Campaigns(New York: Fordham University Press, 1994), xiii. ↑ Cal McCarthy, Green, Blue, and Grey: The Irish in the American Civil War (Cork, Ireland: Collins Press, 2009), 12. ↑ Kerby A. Miller, Emigrants and Exiles: Ireland and the Irish Exodus to North America (New York: Oxford University Press, 1985), 360-361. ↑ David T. Gleeson, The Green and the Gray: The Irish in the Confederate States of America (Chapel Hill: University of North Carolina Press, 2013), 21. ↑ McCarthy, Green, Blue, and Grey, 45. ↑ D.P. Conyngham, The Irish Brigade and Its Campaigns, ed. Lawrence Frederick Kohl (1866; repr., New York: Fordham University Press, 1994), 49. ↑ William McCarter, My Life in the Irish Brigade: The Civil War Memoirs of Private William McCarter, 116th Pennsylvania Infantry, ed. Kevin E. O’Brien (Cambridge, MA: Da Capo Press, 1996), 178. ↑ The U.S. War Department, War of the Rebellion: The Official Records of the Union and Confederate Armies, 128 vols. (Washington, D.C.: Government Printing Office, 1888), vol. 21, p. 129. ↑ McCarter, My Life, 179. ↑ Conyngham, The Irish Brigade, 343. ↑ Tucker, Irish Confederates, 63. ↑ George E. Pickett and LaSalle Corbell Pickett, The Heart of a Soldier: As Revealed in the Intimate Letters of Gen. George E. Pickett (New York: S. Moyle, 1913), 66. ↑ Conyngham, The Irish Brigade, 337. ↑ McCarter, My Life in the Irish Brigade, 175. 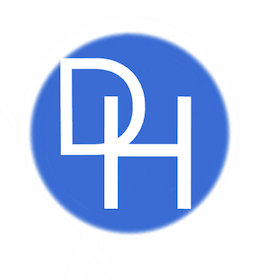 This page was last edited on 22 November 2018, at 14:13.